Tangled and True: finger paint. 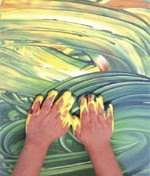 Martha says, "Homemade finger paints are nontoxic, washable, and always available." Recipe: Stir 4 tablespoons of sugar and 1/2 cup cornstarch together; add 2 cups of cold water, and heat over medium heat until the mixture is thick (the mixture will further thicken as it cools). Divide into four or more containers, and add food coloring as desired. Ooh, I like the recipe. That's always good to keep on file. I'm sure Cole would love doing it right now! I will be trying this one out. What fun. Oh, and the kids can play too!